A’ International Building Components, Construction Materials, Structures & Systems Design Awards are now open for nominations. 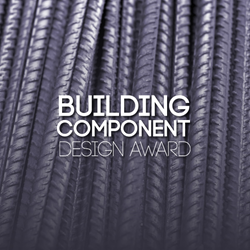 A’ Design Award and Competition is pleased to invite building component companies, construction material producers, construction system manufacturers and industrial designers to submit their building components for award nomination. Entries to the A’ International Building Components, Construction Materials, Structures & Systems Design Awards can be made till February 28, 2015 and the results of the accolades will be announced on April 15, 2015. Previous winners of the A’ International Building Components, Construction Materials, Structures & Systems Design Awards can be seen online at designmag.org where design enthusiasts and press members could access high-resolution images of awarded works. The DesignMag.org is a great source for design inspiration, also a guideline for architects to choose the best materials. Entries to the competition are peer reviewed and anonymously judged by a grand jury panel of design scholars, media members and practicing professionals. Laureates of the A’ International Building Components, Construction Materials, Structures & Systems Design Award winners are eligible to receive the A’ Design Prize. The A’ Design Prize was especially designed to push and promote awarded designers by providing them publicity and visibility. Award winners receive press release preparation and distribution, an exclusive interview, and invitation to join the glamorous black-tie gala-night and award ceremony in Italy. Laureates of the A’ Design Award and Competition also receive the design excellence certificate, hardcover yearbook of best designs and international exhibitions.